Spending several vacations in New Mexico has given me real appreciation for the traditional flavors of the region. I'll spare you a complete recap, as I've previously drooled and blogged at length about my love affair with tamales, green chiles and posole. But it's time I introduced another (new) favorite, an ingredient I wasn't terribly familiar with, or at least cooking with; blue corn. OK, first, because I'm a bit of a food-history geek, I thought I'd share with you a few tidbits. Blue corn is native to the Southwest, planted, cultivated, and harvested completely by hand, (because of a tendency for the fully loaded stalks to fall over in the fields). Consequently, it's more scarce and more expensive than white and yellow corn. Blue corn, until recently, rarely appeared outside the Southwest. It's a staple of the Pueblo tribes, who grow it for themselves and use it to make a hot cereal called atole, various boiled breads and dumplings, tortillas and a very thin, many layered rolled bread (similar to phyllo dough) called paper bread. 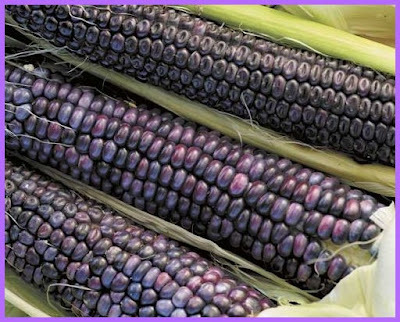 Blue corn is higher in both protein and lysine than regular white or yellow corn. Besides being a major staple of the Native peoples it is also an important element in some religious rituals. It was believed that blue corn helped strengthen especially ill or pregnant women and was traditionally served before strenuous activities or preparing for journeys. Blue corn meal or flour has a coarser, sweeter and nuttier taste than other types of flour corns. It is the basis for many traditional Native American foods and recipes, though most common in blue corn tortillas. Now, of course, you can find blue corn products in most every tourist shop in New Mexico. As with the color of red onions or red cabbage, the color of blue corn is quite sensitive to the effects of akaline substances such as baking soda (or the lime or ash water used by Southwest Indians), dough made with blue cornmeal turns darker blue to greenish. In contact with an acid, like as vinegar, it develops a deep violet to purple cast. Science fun in the kitchen! Yay! Out of curiosity, I brought some beautiful purple-ish blue corn meal back last time I visited, and have been experimenting with it ever since. (The above pic is from the Farmer's Market, I didn't bring back whole ears of corn, I'm not THAT adventurous!). I'm happy to report it cooks up just like regular corn meal, in fact, makes beautiful lavender colored muffins and somehow, tastes like the southwest. Here, then, is my latest blue corn creation, Blue Corn Waffles, a huge hit with my kids on the first day of school, finished off with a silky smooth seedless black-raspberry sauce. (The seeds get in my daughter's braces. You can't have seedy braces on the first day of school after all!!). I added a few nuts for extra protein, and because they enhance the natural nutty flavor of the corn meal (pecans and piñons are native to NM as well) These didn't cook up as brown as regular waffles, in fact the blue flecks make them look a tad on the anaemic side, but not to fear, these are splendidly DELICIOUS!! Mix dry ingredients into a bowl (or batter bowl with pouring spout). Add soy milk and oil and stir gently until well mixed. If batter is not a good ladling/pouring consistency, add a little water or soy milk. Pour into waffle maker, and bake until golden and crisp. Serve immediately with maple syrup or fruit sauce. 3 cups fresh raspberries, or 3 (10-ounce) packages frozen raspberries, thawed, make SURE to keep whatever juices are in the thawed berries. Add water to make 2 1/2 cups. (I pour the water through the strainer to get any last bits of pulp). 2. Stir in sugar and lemon juice to taste. Stir until sugar dissolves. Dilute with reserved juice, if desired. 3. Mix cornstarch with 1/4 cup water, red wine or orange juice. Heat berry puree to a boil, watching carefully and stirring as needed, once it boils, it will boil over VERY fast. As soon as it boils, add cornstarch mixture and lower heat to med-high. Whisk until it comes back to a boil, thickens, and is not cloudy - should take just a minute. 4. Remove from heat, cool a bit (if you can stand it) serve over waffles, cake, ice cream, pancakes, biscuits, shortcake, anything. Ooooo I adore the colour of blue corn. I wish we got more blue corn products here but corn chips about covers it (and you have to get them from the organic store where they cost about $8 for a teeny packet!). I guess I'm somewhat lucky to be living in CO, aka close to NM. The store I always shop at carries organic blue corn meal and organic blue chips etc etc, all pretty cheap too. They haven't had any organic blue corn on the cob though, I'd be all over that! You totally should have got some! I like food history too, so I appreciated that. I love when they have a food or Bible category on Jeopardy. I will often know more than the contestants in those categories, lol. I once found myself shouting at a Jeopardy contestant, "Potatoes originated in South American, not Ireland! Don't you people know anything?" Such a gorgeous ear of corn! what i love most about your blog-(besides looking at the yummy food) is reading your nerdy food info! i appreciate nerds of all kinds, esp. foodie nerds! go nerds! btw, does your daughter have a water pick? i use that to get food outta my braces all the time. I've never actually seen blue corn but I love the chips! This week's column has how to make the green seasoning I wrote about. That corn is gorgeous! I've never seen blue corn! And those waffles.. great idea.. droool! Wow! I love corn waffles, so I bet these are even better. I definitely like blue corn chips better than the yellow corn kind. That corn is gorgeous! Wow--so vibrant and impressive! I love the color of that blue corn! And the waffles look delicious. I see you don't use any binder like tofu or applesauce or ground flaxseed? that blue corn is surreal! And your sauce looks delicious. Cool! I've never seen ears of blue corn before. Your waffles and sauce look divine. I've never bought blue cornmeal, looks like it's fun to play around with. The waffles are gorgeous! 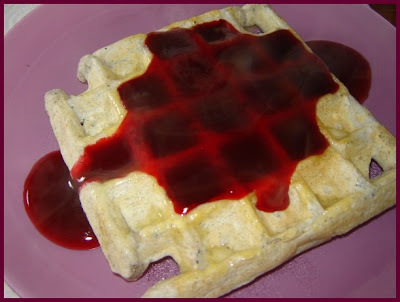 Whoa, the waffle with the oozing raspberry sauce picture is crazy! Gorgeous. Ah, nice mama - blue corn waffles with seedless raspberry sauce for the first day of school. And here I thought blue corn was just a pretty novelty. Thanks for the history lesson.